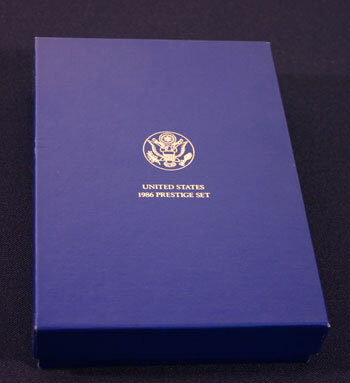 After not producing a Prestige Set in 1985, the United States Mint resumed the program in 1986 with a whole new size and look to the package. 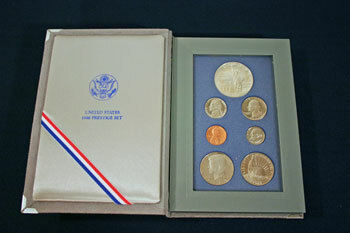 In addition, the 1986 set contained seven coins not six with five standard proof coins and two commemorative proof coins, a silver dollar and a clad half dollar. The coins equal $2.41 in face value. The US Mint initially sold the 1986 Prestige Set for $48.50 which would be $96.31 in 2010 money using the Bureau of Labor Statistics' Inflation Calculator. 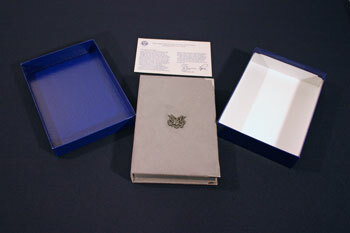 The rich cerulean blue of the outer box provides a contrast for the silver imprinted heraldic eagle emblem and the inscription "UNITED STATES 1986 PRESTIGE SET." The box measures 5 1/4 inches by 7 3/8 inches by 1 5/8 inches. 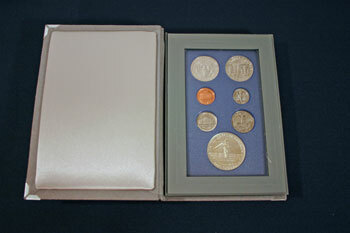 Inside, the two-piece box securely holds the book containing the seven coins and the Certificate of Authenticity. Gray suede covers the padded exterior of the book with metal brackets protecting the corners. In the middle, a metallic emblem in the shape of the heraldic eagle design decorates the cover of the book. Inside the front cover, a blue heraldic eagle design and the inscription "UNITED STATES 1986 PRESTIGE SET" contrasts on the pale gray padded fabric. In addition, a red, white and blue ribbon attaches across the lower left. This ribbon could be used to hold the Certificate of Authenticity. To the right, pale gray and blue plastic holds the seven coins securely. Each coin, obverse and reverse, are protected between clear acrylic. The commemorative silver dollar takes the prime space at the top of the set with the commemorative clad half dollar at the bottom right. Inside the back cover, a softly padded gray fabric protects the clear acrylic over the reverse of the coins. The silver dollar commemorating the Statue of Liberty shows a full view of the statue with Ellis Island in the background. Though Ellis Island is to the right when facing the Statue, the artistic view on the obverse of the coin highlights the importance of both national monuments. Initially called Bedloe's Island, the Statue of Liberty sits on what is now known as Liberty Island at the mouth of the Hudson River between New York and New Jersey. Today, the Statue symbolizes freedom and liberty around the world. Did you know the copper "skin" of the Statue is roughly the thickness of two pennies? At 305 feet and 1 inch tall, the copper skin, though thin, weighs 62,000 pounds. The Statue became a collaboration between the French and the Americans. French artisans made the statue, but American forces built the pedestal. After finishing the base, workers threw silver coins - and they would have been silver, not cupro-nickel clad, in 1886 - into the final mortar. For those of you who have visited the Statue of Liberty and for those who have not, the National Park Service provides an educational virtual tour of the Statue, her history and fun facts. Several separate inscriptions honor the obverse of the commemorative silver dollar: "LIBERTY" around the upper right rim, "ELLIS ISLAND GATEWAY TO AMERICA" over the image of the Ellis Island Museum and "IN GOD WE TRUST" to the right of the Statue. "1986" is engraved below the Statue. The reverse of the commemorative silver dollar contains the hand holding the torch raised high to shine a beacon to the world. Inscribed across the coin, a portion of the sonnet, The New Colossus by Emma Lazarus, states "GIVE ME YOUR TIRED, YOUR POOR, YOUR HUDDLED MASSES YEARNING TO BREATHE FREE." The sonnet, written in 1883, helped raise funds to build the base for the Statue, however people were not that enamored with the poem initially. After her death, a friend found and promoted the poem as part of the Statue's history. In 1903, the sonnet in its entirety was placed on a bronze plaque on the base of the statue. 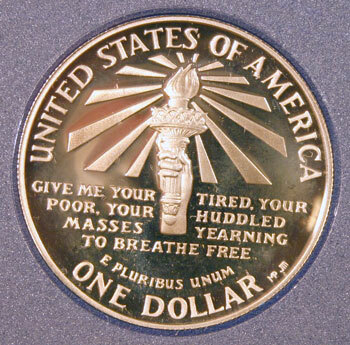 The reverse also includes the inscriptions: "UNITED STATES OF AMERICA," "ONE DOLLAR" and "E PLURIBUS UNUM." 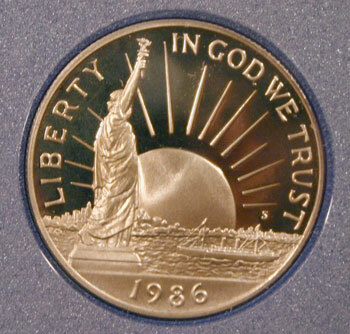 The cupro-nickel clad half dollar shows the Statue of Liberty welcoming a ship into the harbor. In the background, the sun rises on a new day of opportunity for the immigrants arriving on the loaded ship. "LIBERTY" and "IN GOD WE TRUST" follow the rim of the coin above the horizon. Below the Statue and the harbor, the year "1986" is engraved. 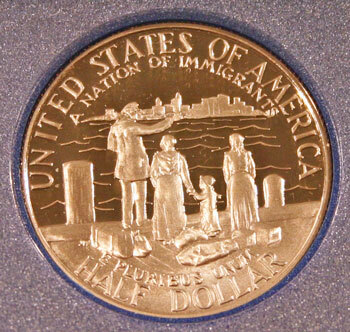 The commemorative half dollar's reverse shows an immigrant family standing on Ellis Island and looking toward American land. With all of their worldly belongings in just a few bags and valises laying at their feet, the family of four looks across the water toward a better life and the fulfillment of their dreams. Many Americans can trace their ancestry through the entrance to America at Ellis Island. Opened in 1892, Ellis Island became the primary federal immigration center. Over 12 million people were processed through the facility until its closure in 1954. "UNITED STATES OF AMERICA" and "A NATION OF IMMIGRANTS" are inscribed across the top of the design. At the bottom, "E PLURIBUS UNUM" and "HALF DOLLAR" complete the inscriptions. These coins not only recognize and commemorate two important monuments to our nation's history, they also remind us of the liberty and freedom we have enjoyed for over 200 years. We cannot measure the value of our liberty and freedom. 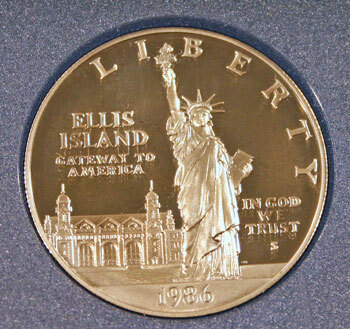 But, the number of people who wanted to see the Statue of Liberty and to enter our country through Ellis Island as recognized by these commemorative coins help us appreciate the independence we enjoy in our lives to this day.